Live Monitoring is a local South African software house that develops MES as well as asset monitoring and energy efficiency systems to provide a competitive edge through cost effective live insight into production processes. All manufacturing industries face increasingly difficult trading conditions due to a depressed economy, in South Africa this is compounded by rising input costs, especially electricity and labour. In order for them to remain globally competitive therefore, they need to ensure maximum output value from assets and equipment. ProduMax and PowaMon have been successfully deployed on the shop floor in a number of manufacturing industries. This is especially the case in injection moulding, printing, carpeting and textiles, where clients have indicated they have improved production efficiency by more than 11% and managed to get ROI in a matter of months. ProduMax is a tool that helps to improve manufacturing efficiencies, reduce downtime and visualise production data. While PowaMon is a live energy consumption data collector, billing, alert and reporting engine, which helps companies visualise their power consumption, set goals and be alerted of issues. ProduMax enables manufacturers to monitor their production process in real-time. This enables the operators and management to view their efficiency visually and adjust or report on issues as they occur. The data is logged for historical analysis and reporting, which enables the bridging of manufacturing processes between the shop floor and the management processes, an often overlooked link in manufacturing. The ProduMax system also has an alert engine that warns users of events such as machine downtime or performance problems. This allows the timely correction and improves production output before it affects downstream processes. PowaMon is a specialised module of the LiveMon asset monitoring platform, which collects data from a range of sensors and devices, and is easily extendable when required. PowaMon is also designed to collect data from smart meters installed onsite or remotely. Alerts can be set using the LiveMon core to be sent via SMS or email if data is out of thresholds i.e. low power factor correction etc. PowaMon and ProduMax enable powerful web services, which allow further data integration and interrogation utilised to produce real data on power consumed per item produced. They allow the fine details to be examined to determine the impact of energy efficiency projects and identify wasted energy usage. Visualisation enables power draw to be monitored against the impact on time of use tariffs for the reduction of consumption during peak periods. Recent enhancements to the platforms include the Mobile HMI for ProduMax, where users and managers can view and operate the Produmax or LiveMon solution via a tablet or mobile device. Currently biometric integration is being added to allow for positive operations identification and tracking via data streamed into an analytical engine. 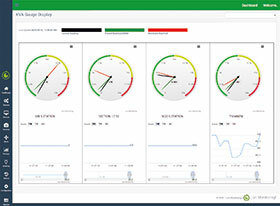 Even though the current LiveMon platform is already IP-based and can be hosted in a virtual environment, Live Monitoring has secured the first round of funding to develop a proof of concept solution that will see the ProduMax, GreenMon and LiveMon functionality built into an IIoT cloud-based solution coupled with dedicated modular sensors for a full end-to-end cloud hosted system that includes a platform for sharing knowledge and ideas.